← The Beginning of the End of Stylish Travel? Italy is the only place I’ve visited where I’ve felt underdressed. And if you’ve been reading my blog for a while, you might guess that I wasn’t. A quick stroll through The Sartorialist’s postings about Milan’s Pitti Uomo on Men.Style.Com will reveal a wealth of sartorial delights and one unassailable truth: Italians know how to do casually elegant better than anyone else. Now, admittedly, he’s cherry-picking the best of the best. And he is shooting fashion insiders. But still, year after year, they manage to look stylish and rarely are they dated or outmoded. With a few obvious exceptions. He’s reporting, not recommending. Is it bred in the bone? No, I don’t think so…. It certainly is an age-old thing, though. “The Book of the Courtier” might be the art form’s bible. Renaissance paintings show exceptionally (for the time) well-dressed people. Even artists (think of Raphael — the bon vivant — and his self-portrait in one of the murals in the Pope’s library, I believe) took care with appearances. So can we deconstruct the casual elegance of the Italian man for the edification of we clueless (present company excepted, of course) Americans? Here are a few things that I notice. If you can think of any others, feel free to chime in. Ten Steps to Approximate the Italian Casual of Those Doing it Right. 1. Fit. Italians’ clothing fits. It is tailored to look the best it can on the person wearing it. Sometimes the wearer has tailored it himself….. Even if it is an homage to a particularly ridiculous style. I’m thinking of the too short, too tight Thom Browne look. An Italian will wear it as fashionable, but he won’t take it to extremes, and will make sure that he looks good in it. 2. Brown Suede Shoes Go with (just about) Everything. Except black trousers. Ditto for brown shoes in general. But the suede really ups the style quotient a notch. And I’m addicted to them. This has got to be the number one stylish travel tip. Brown suede shoes (often with rubber walking soles like Dainite®) are comfortable and stylish. Save the sneakers for the gym. 3. High Quality Materials: suede, tweed, cashmere, camel’s hair, worsted wool, silk. The clothing and accessories are always made of the best stuff. 4. The Scarf: long and wrapped, worn with everything when it’s chilly. 5. Layers. Sweaters, scarves, pocket squares, jackets, coats, gloves…. It’s all here. I bet you can find hats being worn. And I don’t mean sideways turned baseball caps, either. 6. Pattern Mixing. They aren’t afraid of wearing more than two patterns. The trick is to alternate the scale. 7. Colour. Italian men aren’t afraid of adding a little colour. Even with a very dark outfit, something will pop. A red scarf, for example. Or a pair of bright yellow eyeglasses peeking out of a breast pocket. In back of the pocket square, of course. 8. Grooming. Even when sporting artfully disheveled long or short hair and a three day growth of beard, they don’t look homeless. The key here is the word “artfully.” The look is deliberate and well-orchestrated. 9. Something is a little off. The hair or beard is “wrong” for the look. Or the tie is askew. Collar points bend up. Bracelets are tied at French-cuffed wrists. Those same French-cuffs are left open. Tough to pull off, it’s called “sprezzatura.” And it’s not an accident. Sart’s photo is a great example. 10. Very few blue jeans. At least that I remember. Nowadays, they tend to be white, too. 11. Confidence. They know they look good and take pains to prove it to you. See number 9. This entry was posted in Cultivating and tagged casual clothing, Cultivating, travel. Bookmark the permalink. When I lived abroad, you could spot the Americans a mile away… sneakers, jeans and baseball caps. Even when Europeans wore the same thing, you could still spot the Americans… They were lacking style and a certain flair. I dunno. But I’d like to see more people try. 12. Europeans always invest in “quality” fabric. One Tailored Blazer in Super fine Wool is far better than 10 polyester ones, right! Italians know how to accessorize, add 1 gorgeous woman, Sophia Loren comes to mind! Quality on all counts wins every time. And Ms. Loren! Well, La Belle Figura indeed! 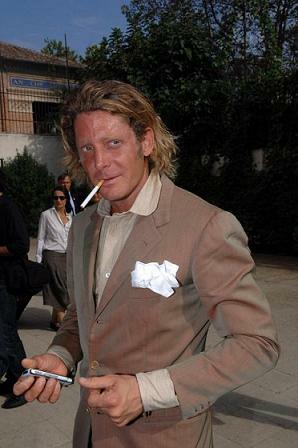 Didn’t I read somewhere that Lapo Elkann wears a lot of his grandfather’s suits that have been re-tailored to fit him? Quality lasts generations. The gentleman pictured looks like any number of my clients after posting bond from the local drunk tank. To each his own, I suppose. Oh, your posts on mens clothing make me feel so wistful. My husband is not a good dresser, and I do not have the patience to shop for him, or shop with him. Once a year, I will force him to make the trip to Nordstrom to refresh his wardrobe, but I am coming to the conclusion that he needs a stylist. I did buy him some ‘slim fit’ Brooks Brothers no-iron shirts for Christmas (he is tall and slim), and that was a huge improvement. Baby steps, I suppose. I will keep on reading your blog for suggestions that I might be able to implement. I love the brown suede shoe recommendation. I have purchased two pairs of brown suede heels for myself this year, and they are wonderful and versatile. Let me know if I can help. Most guys are just afraid of looking like idiots and being made fun of in the locker room. Slim fit shirts are a great start. But take into account what he does and how they dress. Then work towards getting perfectly fitted. That will go a long way. My friend, the architect, wears khakis, a polo neck sweater or a button down shirt, sport coat and Belgian slippers most days. And he looks great always. Tall and slim is a great build to have. Those photos are amazing. Very inspiring. Some of the tweeds are gorgeous. I love how Italians (and others) can wear tweed suits without looking frumpy. I’ve always thought the Italian look was a variation on a British theme. The Italians simply add a bit of flair and colour to a basically British (or English if you will) look. Luciano Barbera is a good example. Your comment about brown suede shoes is spot on. I love them and have worn brogues in a ‘snuff tobacco’ suede since a teenager. In fact I just ordered another pair. I couldn’t agree more. Inspiring is the word. And yes. Sr. Barbera is a great example. I have some shots from his website that I may have to post about. The Italians do what Ralph Lauren has done; taken the Brit-lit look, repackaged it, added a bit of color and sold it right back. I quite like it. I’ve got my snuff tobacco Church’s on today. The day I bought them in London was the day that I felt the most elegant man in town. Thank you so much for these tips!! Most helpful. I agree with you on scarf go with everything although men think scarf is feminine but it’s elegant. A brown suede shoes (especially darker brown you can’t tell black or brown) go with everything – you are right about that too. Not sure if you check the comments for older posts, but I thought this questions/recommendation fit here. Have you seen the preview for the upcoming film “I Am Love” starring Tilda Swinton? Looks gorgeous, I plan on seeing it for the visuals alone. Should make a wonderful date night for my wife and I.